There is something about the holidays that brings out so many family traditions. I love to reminisce with my family about some of the traditions that we had when I was a kid. Just the other day I was talking to my parents about how we always started Christmas morning. My three sisters and I would sit on the stairs waiting for my dad to give the okay that we could come into the room with all the presents. Every single year he’d say “Sorry girls, it looks like Santa didn’t come.” Then we’d have some sort of response and he’d reply that he’s kidding and to come in and see what he left. I don’t think my dad was shooting for a tradition but it became one over the years and I will cherish that memory for the rest of my life. It’s fun to carry on some of the traditions that my husband and I had when we were kids and we enjoy creating our own new ones too. This year we are starting a new cookie tradition. 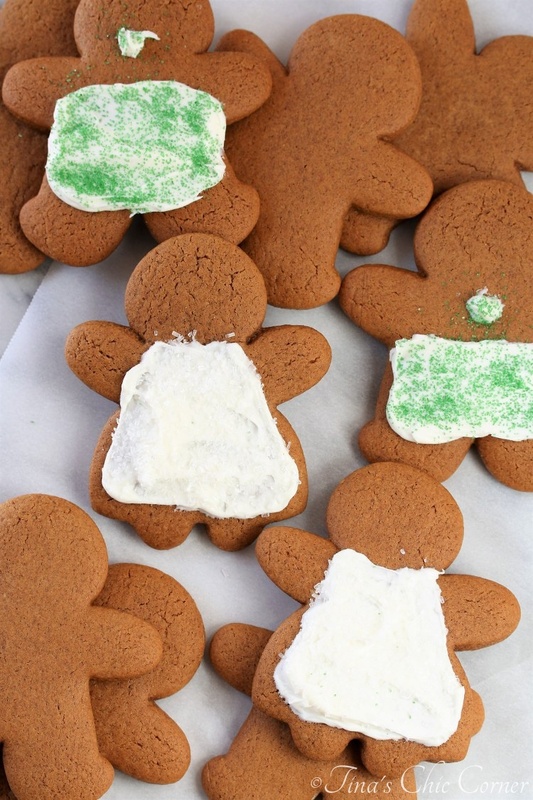 I’ll still bake lots of cookies, but they will always include a batch of these gingerbread man cookies. I’ve always loved gingerbread cookies and in fact they are my favorite cookie during the holidays. The trick is that the recipe has to be just right. 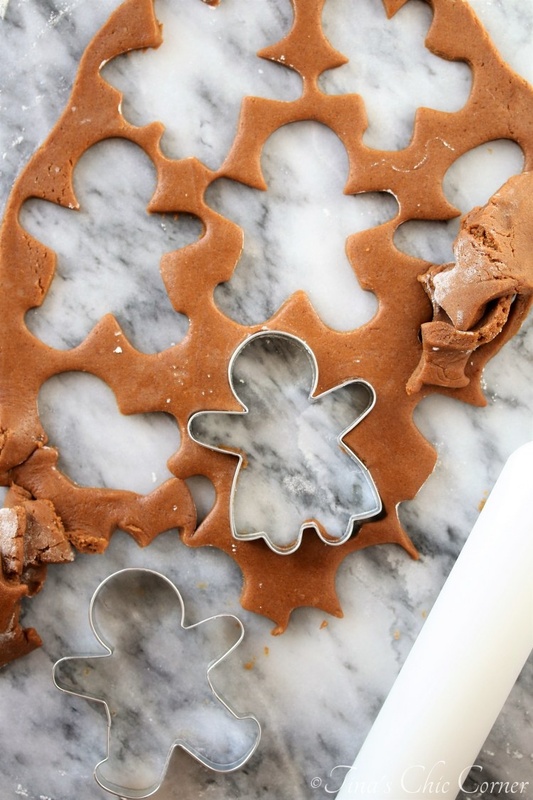 Similar to a chocolate chip cookie, there are a bazillion gingerbread cookie recipes out there. However, gingerbread cookie recipes can be very different, yielding a completely different tasting cookies. 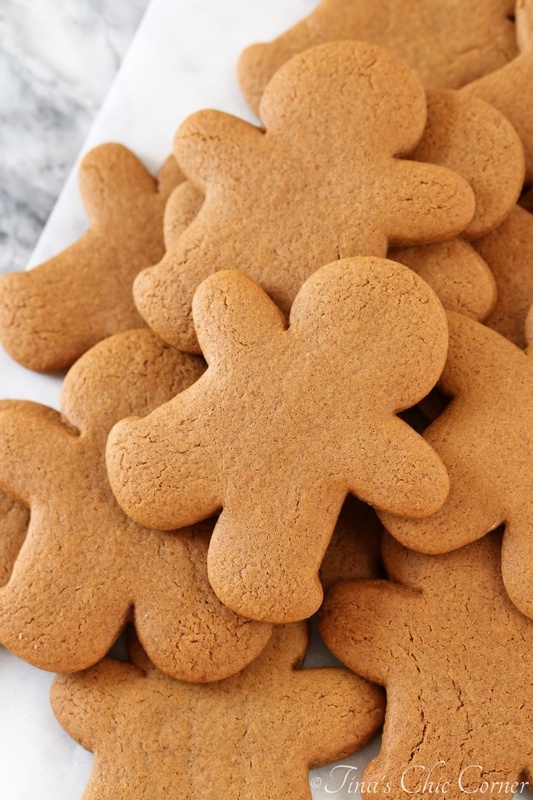 Some gingerbread cookies can be bland or the complete opposite and be too spicy. Some could contain a spice that you don’t care for (or maybe you like it but there’s too much of it). My neighbor makes these cookies every year for her family. 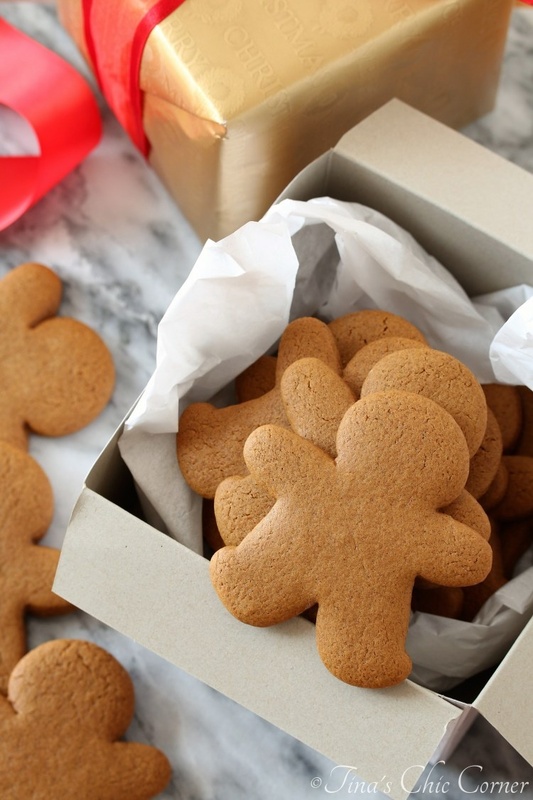 A few years ago she shared this recipe with me and it’s the first roll out gingerbread cookie recipe that I’ve ever really loved, and I’ve tried quite a few. Normally I can resist the cookies that I set aside for gifts but I cannot resist these. You can ask my husband because he’s seen me sneak a few. I’m not very good at making roll out cookies (queue the perfectionist) but I decided that this year was the year that I’d step outside of my comfort zone and go for it. These cookies are soft and they have just the right amount of warm spice to them. Everyone has their own preference, but I think that these are the perfect gingerbread roll out cookie. After baking a few batches of these cookies, I’ve figured out a few easy tips that worked for me. Make sure that you measure the flour correctly to get the consistency of cookie that you see in these pictures. Too little flour means that your cookies will spread and too much flour means that your cookies may taste dried out. The correct method to measuring flour is by using a spoon to loosely pile the flour into the measuring cup and then leveling it off with a butter knife. Unfortunately you do need to chill this cookie dough before you bake them. I know that this step can be a pain to plan, but it’s worth it because it will help prevent the cookie from spreading into an unrecognizable shape. Even when though you chill the dough, the cookie will spread a little bit when you bake them, but not enough for it to make your cookies unrecognizable. I chilled the dough overnight so that I could jump right into baking them the next day. It was nice knowing that most of the prep work was already done. I tried freezing the cookie dough (after rolling out and placing the cut out cookie shape onto the cookie sheet) for about 15 minutes and I found that it literally did not make any difference. The cookies looked the same as if you had not frozen them. Since the goal was to reduce how much they spread out, and they still spread out, all it turned out to be was a pointless extra step. Make sure that you roll these cookies out to a 1/4 inch thickness. Rolling these out thick helps to get that soft cookie texture. Too thin or too thick and you’ll throw off the required cooking time. On that same note, being consistent is important. A thin cookie and a thick cookie on the same cookie sheet will end up with one of them being sad no matter what you do. Don’t worry if you get a little flour on top of the cookies when you’re rolling them out. The flour will bake off. If you are concerned or you got a lot of flour on them by accident, then gently whip the flour away using a pastry brush. I have this pastry brush. 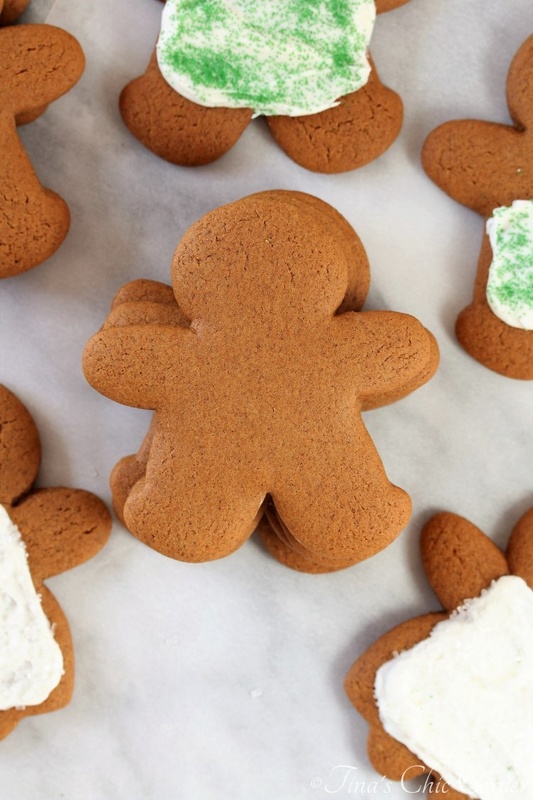 Even though I adore frosting, I actually prefer my gingerbread cookies without them. That’s probably a good thing since I’m so bad at frosting them. What are some of your family traditions this time of the year? Note: This recipe requires that the dough be chilled. I wanted to give you the heads up to factor in the extra time before you start baking. In a very large bowl, whisk together the flour, ginger, cinnamon, allspice, baking soda, and salt. Set these dry ingredients aside. In a medium size pot, add the shortening and melt it on low heat. Once the shortening has melted, remove the pot from the heat. Add the sugar and molasses and mix together. Add the wet ingredients into the bowl of dry ingredients and mix everything together. Chill the cookie dough for a minimum of 3 hours in the refrigerator. I chilled mine overnight in the bowl that I mixed all the ingredients in. Once the cookies are done chilling, preheat the oven to 375 degrees F. Lay parchment paper or silicone mats on the cookie sheets and set them aside. Lightly flour your working service. Take some of the cookie dough out of the bowl and roll it out to about 1/4 inch thick. 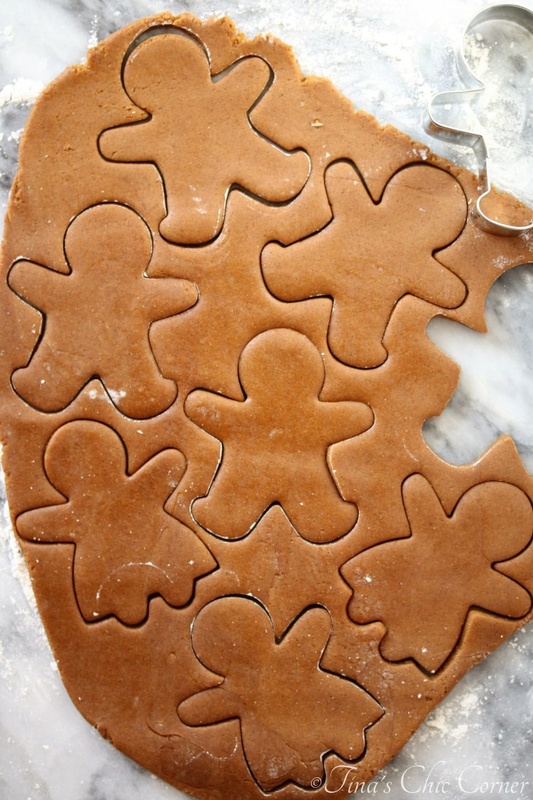 Cut out the shapes and lay cookies onto each prepared cookie sheet, about an inch or so apart from one another. Bake them in the preheated oven for about 8 minutes. Let the cookies cool on the cookie sheet for a few minutes and then move them to a cooling rack to cool completely. If you plan to frost them, don’t do so until they have cooled completely. Source: My neighbor’s friend’s recipe. Awe, they look so cute, Tina. Gingerbread is my favorite cookie and I prefer it without the icing. I love the thickness on your cookies. I’ll have to make sure to roll them out the same as you, Tina. Soft gingerbread cookies and a cold glass of milk….mmmmm!